Ideally located in a vibrant part of Dublin just a two minute walk from O Connell Street. Days Inn Talbot Street offers great value for money and a high standard of comfort. They offer a small private car park on a first come first served basis and they also provide lifts to all floors. The hotel offers 60 modern en suite bedrooms superbly decorated with bright colours and they can accommodate from one to four persons sharing. Wheelchair accessible rooms and non-smoking rooms are available. Every necessary facility is available for convenience and comfort. Facilities include TV, Pay per view movies, Direct dial telephone, Tea / coffee making facilities and a safe can be availed of for a minimal charge. As Days Inn Talbot Street is not a "full service hotel" there is no bar and the dining room is only open in the morning for breakfast. But a heart breakfast it is, the guest can choose from a full Irish breakfast or a range of foods to suit his or her taste. The guest will find a delightful choice of restaurants and cafes close by catering for every need and appetite. 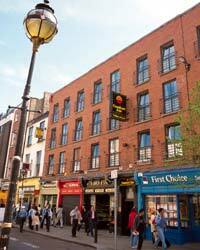 Right in the heart of Dublin’s City Centre the hotel is ideally located for the guest who wants to explore Dublin. There is a vast selection of restaurants, pubs and night clubs, cinemas and theatres close by. The great tourist attractions of Trinity College, Temple Bar, Dublin Castle, Grafton Street, St Stephens Green and Dail Eireann are all just a short walk away.